Do You Want to Lead Your Industry in Customer Experience? We've compiled detailed information on how your organization can get ahead of changes in customer experience (CX) processes and technologies that are coming in the next 12 to 18 months. 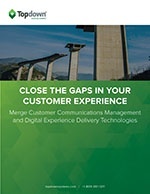 Our free guide draws from a study by Forrester Consulting that uncovered the top 3 gaps in CX preventing 88% of organizations from being very satisfied with their ability to manage customer-facing communications across the entire customer lifecycle. Take the next step toward having the best customer experience in your industry. Fill out the form to subcribe to the blog AND get your free guide! Subscribe And Get Your Copy Now!